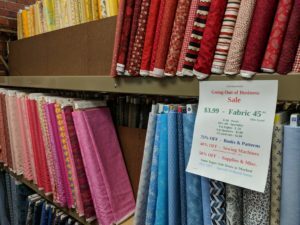 Fabric – 40% / Books & Patterns – 70% / Quilt Supplies – 40%. Prairieland Quilts will close its doors on July 14th, shop now for the best selection. The 2017 Row by Row was inspired by a trip this spring where a pig race was held. With the Row by Row theme “On the Go”, Suzanne couldn’t help herself but put those little piggies on the go here in her shop. The 2017 Row by Row runs (no pun intended) from June 21st through September 5th. Create a quilt using at least 8 different 2017 rows from 8 different 2017 participating RxR shops and be the first to bring it into Prairieland Quilts to win a stack of 25 fat quarters (6-1/4 yards of fabric!). But you have to hurry and beat the piggies! 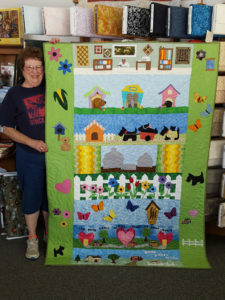 The Finishing Kit for this years Illiana Shop Hop Quilt has been unveiled at Prairieland Quilts. The theme this year is “Illiana through the year” with each of the 11 participating shops designing a block to feature a specific month. 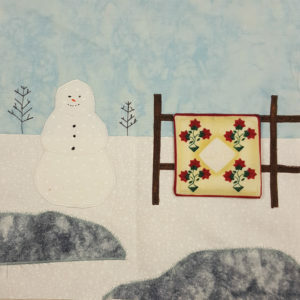 December was our project which depicts a snowman looking over a quilt on a fence. Since there are only 11 shops, everyone also created a March Block. Suzanne designed her finishing kit so it could be used as a complete quilt or 4 seasonal wall hangings. Utilizing elements from the different blocks to create additional features in the quilt. The shop hop runs June 16th through July 1st this year and all shops will have the same hours of operation: Mon – Sat 10am to 5:00pm (local time) and Fridays till 6:00pm. Prizes include a Janome Sewing Machine, 110 Fat quarters, or 11 – $25 gift certificates. Additionally, through the hop, participants receive a 15% discount on fabric cuts of 1/2 yard or more. Our move is over and Prairieland Quilts has re-opened at it’s new location, 107 N. 2nd. Street, back where we started in 1993. It’s just one building to the north of of our old location where Shelia’s Sunny Bloomers now is. 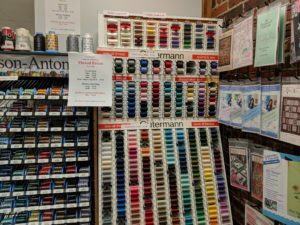 The move to downsize was a challenge but all the fabric, sewing machines, notions and sewing supplies have all found a home and are now on display. 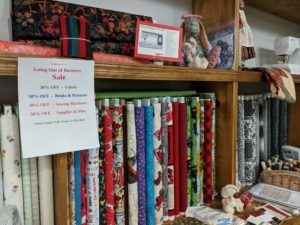 As a thank you for your patience during this move, Prairieland Quilts will be holding a Re-Opening Sale through the month of February. 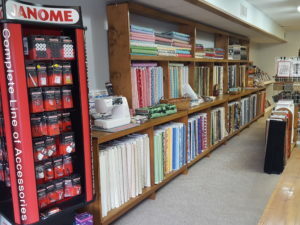 All fabric & notions are 20% off; Sewing Machines are 25% off MFSRP. Prairieland Quilts was featured as part of the WCIA Our Town Cissna Park the last week of July, 2016. 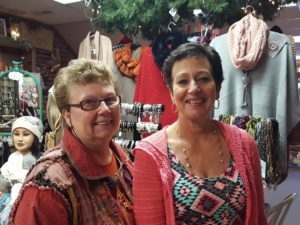 The Anna Carrera interviewed Suzanne & John as a featured shop in the town on Wednesday. On Friday of that week, Abby Llorico, a reporter for the WCIA / WCIX Morning Show was live in the shop to report on the Project Linus blanket day that the store held. Being in a small town, the technical team experienced a little technical difficulties receiving good cell service. A second recording featured all the ladies and each of their jobs as part of the Blanket Day. Unfortunately, that video must have been too long as it never aired. Congratulations (again, our 2015 winner as well) to Mary Hamilton of Gilman, IL for being the 1st person to complete a 2016 Row by Row Experience Quilt at Prairieland Quilts. Her quilt features our block on top with 7 other store blocks. 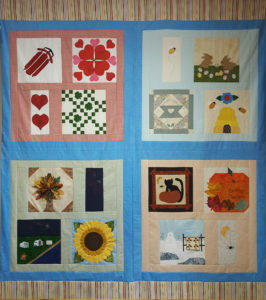 The border is made up of elements from each of the rows included in the quilt. Mary will receive 25 fat quarters plus an additional prize for using the block from our store. Mary’s quilt is on display at our shop. 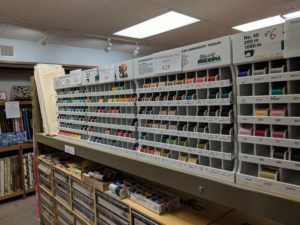 Unable to get to Prairieland Quilts this summer? You are able to order our Row by Row fabric kit with or without the button pack below. The price includes shipping and your payment will be made at the time of the order. Your Row by Row kit will be shipped to you the week of November 1, 2016. YES, that’s a long time to wait but the Row by Row rules prohibit us shipping it any sooner. No refunds or cancellations once the order has been placed.